Are you having trouble coming up with a business name?. There are many free online tools to help people just like you. Here are 6 of the top Business Name Generators. Wordlab’s uniqueness is that it provides industry based business name generators. It has more than half a dozen different generators like Team Name Generator, Restaurant Name Generator, Band Name Generator, etc. It also provides a separate domain name availability checker. NameStation is a great tool if you are looking for a business name along with a domain. NameStation return business name ideas along with the domain availability status. It uses keyword lists, brainstorming, dictionaries, etc. to create random names based on your input.It has features like adding prefixes and suffixes, setting minimum and maximum length and combining keywords with many preset categorized wordlists like random adjectives, random nouns, medicine, music, technical, etc. It also has features to include synonyms and custom wordlists. Use Dot-o-Mator to generate business and domain name suggestions. Enter one or more words, and then choose some prefixes or suffixes (you can also add your own). Click COMBINE to get the results. You can save all the creative business names you like to a scratch board and check availability of related domain names. Company Name Generator is one of the most advanced free online business name generators. You can customize the generator by selecting patterns of vowels and consonants you wish to have. You can also select a wordlist for prefixes and suffixes. Although this service does not provide domain name availability checker it can provide valuable new business name suggestions. Bust a Name is a complete domain name researcher and generator. You enter a few keywords, set options like domain extensions, prefixes, suffixes, hyphen, etc. and hit ADD. You can then sort, search, save and review related domains names. This is one of the top name generators if you are looking for a business name for an online venture. Write Express helps name businesses, products and websites. You start by entering a word or syllable that is associated to your business. You then choose a wordlist, number of desired syllables and a few more options and hit FIND NAMES. This is an easy to use tool and can help you find a business name from dozens of potential names in quick time. 2011 is here and those of you looking for ideas on what types of businesses to start do not have to look very far. Inc.com has put together a list of the hottest home businesses for 2011. When Dennis Anderson was asked if he considered himself more of an artist or an entrepreneur, he thought for a moment and replied, “Well, somewhere in between. I like creating things.” Anderson has achieved what so many Americans crave: he has turned his craft—organic soap making, or saponification—into a profitable business from his home. Anderson Soap Company launched in 2007 in his California apartment, and has since moved into a rented house in Portland, Oregon, where he lives with his fiancée and children. Anderson, who started out as an accounting major in college, fell in love with soap making after taking a chemistry course that taught him the process. He has sold soaps to buyers in all 50 states and distributes internationally to Malaysia, Singapore, France, and Sweden. The children’s clothing industry is a multi-billion dollar market, and a recent surge of interest for specialized kid’s gear has given companies like Monkey Toes, a Colorado-based venture run by Jenny Ford, a niche in this burgeoning market. Monkey Toes is a line of animal and insect-themed footwear for children. Ford started the company in 2002 after drawing designs on her daughter’s shoes. “I thought, ‘Oh, that’s cute,’” Ford recalls. “I fell in love with it.” She chose to keep her business at home to be able to spend more time with her two young daughters, but lack of an office hasn’t stymied the growth of the brand. Ford currently distributes in stores all over the world, and recently signed a new distribution deal that will take the product into the hands of 100 representatives around the country. Ann Whitley Wood is an attorney-turned-entrepreneur who saw a market for designer goods and collectibles on eBay nearly 10 years ago. In what started out as a hobby, Wood now manages over 350 listings on eBay through her store Willow-Wear, and works with about 40 clients on any given day from her home in Texas. In 2010, Wood sold over 1,100 items for about $450,000—making her one of eBay’s true “powersellers.” Though she does not keep inventory in her house, working from home has been an integral part of her business. “I had to be able to sell on eBay from home, in between taking care of my children and managing the rest of life,” Wood says. To be successful as an eBay entrepreneur, Wood says you must have an acute understanding of your product, as well as your competition. Wedding dresses are bought (one hopes) only once, making them one of the most expensive purchases in a woman’s life. So Emily Newman thought, why not buy second-hand? “I saw a need where women my age were dealing with a lot of the same things,” says Newman, the founder of the Once Wed, an online wedding community, based in Atlanta. “They didn’t have a huge budget, but they still wanted to wear a beautiful dress.” So Newman and her husband, who works in online advertising, teamed up to launch Once Wed, a site for brides-to-be. The site has grown from a used dress listing service to the be-all resource for brides, similar to TheKnot.com. Once Wed puts together inspiration guides and a popular blog, which helps drives traffic to the site. Ann Gaffigan felt that there needed to be more mainstream media coverage of women’s sports. So, about two years ago, she teamed up with two co-founders to launch WomenTalkSports.com, an online network that has become one of the most thorough purveyors of women’s sports news. “We didn’t research the market for this,” Gaffigan says from her home in Kansas. “It just came from our belief that something like this really needed to happen, and we want the next generation to see positive female role models.” There are over 100 websites that link to WomenTalkSports.com, and about 70 bloggers on the site. While the site’s traffic varies depending on the season, the site swells when national competitions are brought to the spotlight. During the Vancouver Olympics, for example, the site had over a million visitors. Who said custom designed shirts had to be expensive? Blank Label is a Boston-based start-up that allows users to design custom dress shirts, choosing the fabric, pattern, buttons, and size, for a modest price under $100, depending on the extras. Blank Label was created by Danny Wong (center) and three co-founders (and classmates) in the summer of 2009. After a brief period of incubation by their college, Babson, the team chose not to take on an office lease. “It worked better for us,” says Wong. “We didn’t want to pay for office space.” The founders lived together in Shanghai for several months, developing relationships with suppliers and working out of their living room. At one point, they were operating with members based from home in three different time zones around the world, but Wong says it’s never been a problem. Stacy Blackman knows what it takes to get into one of the nation’s top MBA programs. Blackman, a who received her own MBA at the Kellogg Graduate School of Management at Northwestern University, turned her passion for helping students gain admission into MBA programs into her full-time job after years working in private equity. “When I first started my business, I wasn’t trying to start a business; I was just doing something I really enjoyed.” Now, Stacy Blackman Consulting has turned into one of the premier MBA international consulting firms, with clients and consultants based all over the world. Blackman has even graced the cover of Fortune, and published a book titled The MBA Application Roadmap. Visit www.inc.com for more information. Cheap Hype for Your Business!! Looking for low cost ways to advertise your business? UpHype is a micro-payment marketplace where savvy people with unique talents and resources advertise to take your message and promote it in unique ways. Simply priced at $8, $16, or $24. 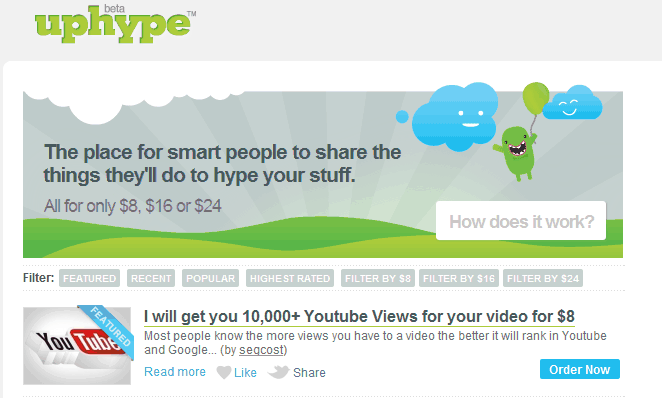 Anyone can create a hype or small service ad of what they’re willing to do to “hype” your message. Buyers can purchase hypes and are required to pay for the hype in advance. After the work is completed and accepted by the buyer, UpHype gives the task performer a whopping majority of the fee. Hypes range from promoting your message to a user’s 300,000 Twitter followers, sending 60,000 traffic hits to your website, creating a video podcast, writing a press release or article for your blog and anything in between. Hypes are divided into categories, including Social Marketing, Graphics, Writing, Eblasts, Flyers, SEO work, Website Back-links and whole lot more! To ensure that you get a good task performer, UpHype also post buyer feedback on people who perform tasks. Task performers will be given a positive feedback score, which can be seen by users who are considering hiring them for their hypes. Kickstarter is a website for funding creative projects. The website has funded a large number of projects, ranging from indie film and music to journalism and food-related projects. 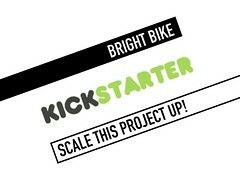 Kickstarter provides a platform where people can raise money from the general public. Project owners choose a deadline and a target minimum of funds to raise. If the chosen target is not gathered by the deadline, no funds are collected. Money pledged by donors is collected using the Amazon Payments system, and initiating projects require a U.S. bank account. Kickstarter is a site for projects from the worlds of music, film, technology, art, design, food, publishing, and other creative fields. Fundraising for projects only. What’s a project? Making a new line for your fashion label, recording a new album, building a game. Projects are specific and finite. Are you looking for manufacturers to who can help bring your products to life? why not try Alibaba.com. Are you looking for shoe manufacturers? or manufacturers who can work with you to develop the latest brand of makeup?. You can find a manufacturer for virtually any type of product on Alibaba.com. Alibaba.com is the global leader in e-commerce for small businesses and the flagship company of Alibaba Group. Founded in 1999 in Hangzhou, China, Alibaba.com makes it easy for millions of buyers and suppliers around the world to do business online through three marketplaces: a global trade platform (www.alibaba.com) for importers and exporters; a Chinese platform (www.1688.com) for domestic trade in China; and, through an associated company, a Japanese platform (www.alibaba.co.jp) facilitating trade to and from Japan. Alibaba.com also offers a wholesale platform on the global site (www.aliexpress.com) geared for smaller buyers seeking fast shipment of small quantities of goods. Together, these marketplaces form a community of more than 53 million registered users in more than 240 countries and regions. Alibaba.com has offices in more than 60 cities across Greater China, India, Japan, Korea, Europe and the United States. When dealing with any online business, you want to make sure you take the necessary precautions to protect yourself. Here are some tips to prevent you from being a victim of fraud. Do your homework. Don’t just take a supplier’s word to be the truth. You are ultimately responsible for your business and the deal you do, so make sure you are comfortable. Once you find a supplier you would like to do business with, Google them. Do a search on Alibaba.com forums on the Safe Trading Center. Ask other people involved in global trade if they’ve heard of them. Ask for references. When you find a supplier it will tell you how many years they’ve been an Alibaba.com member. We strongly recommend that you work with a GOLD SUPPLIER (this means they’ve been verified by a third party), but you should also ask them for references of other companies they’ve done business with in the U.S.
Do a bank reference check or credit check on your potential supplier. This way you can find out if there are any outstanding problems pending. Familiarize yourself with import/export terms and laws. You don’t have to be an expert to do this, but you need to know the basics to make sure you are covered and that your goods don’t get stopped in customs. The Official Alibaba.com Success Guide by Brad and Debra Schepp is a great place to find out everything you need to know to get started. If a supplier is pressuring you to make a decision fast or send money quickly, don’t do it. This is a red flag and a quality supplier will be willing to work with your timeline. Be very careful in the payment method you select as this will make a big difference in how you are protected later. Top Networking Sites for Entrepreneurs! Are you getting the results you want for your business on Twitter and Facebook? Although they are both great websites for advertising your business and for networking, you may want to explore other options. Below is a list of networking sites we feel are best suited to entrepreneurs. Networking is an essential part of any business because it allows you to build new business relationships and generate business opportunities at the same time. Many entrepreneurs agree that business networking is a more cost effective method of generating new business than advertising or public relations efforts. This is because business networking is a low-cost activity that involves more personal commitment than company money. The purpose of the site is to allow registered users to maintain a list of contact details of people they know and trust in business. The people in the list are called Connections. Users can invite anyone (whether a site user or not) to become a connection. A business network for creating contacts and sharing knowledge. A community by Entrepreneur.com where professionals can network, communicate, and collaborate with others. A business network where professionals can market their business and make connections. The platform offers personal profiles, groups, discussion forums, event coordination, and other common social community features. Basic membership is free. Biznik is an award-winning business networking community for anyone growing a business. An online community to help business owners grow their businesses. A business network that combines online business networking and real-life events. A community focused on the exchange of ideas between entrepreneurs and aspiring business owners. A forum-based site for entrepreneurs and small business owners who are passionate about promoting business for themselves and others.